Ever since my family moved away from New York, there was one thing we could depend on every time we returned - the Kings Plaza Diner on Avenue U in Brooklyn. Growing up, we were regulars, calling the place "Patty's" (I believe after one of the owner's daughters) and having our usual meals - mine was two eggs, over-easy, french fries, and sausage. I would dip my fries in the yolk, snack on the sausage, and mop up the rest with a piece of toast, and don't forget those tasty pickles - nothing said I was home more then a nice meal at my local diner so you can imagine my surprise when I discovered my favorite restaurant closed on Sunday. Having cooked a few million burgers and a gazillion fries, Brooklyn's landmark Kings Plaza Diner turned off its neon sign Sunday night for good. The 35-year-old go-to grill was to shutter its glass doors at midnight, leaving regulars crying in their corned beef. "This was our swan song," said Harvey Zitter, 61, of Brooklyn, splitting a tuna salad sandwich with his wife. "It's like a family here," said Zitter, who has patronized the Avenue U eatery several times a week for as long as he can remember. "They know your name and treat you so well. The food is great, too." Ann Kirchner, 49, of Bergen Beach, had tears running down her cheeks for the diner she's been coming to since she was 13. "I've been here since they had hair," said Kirchner, pointing to the two bald managers at the cash register. "It wasn't the food that brought me back. You always saw people you knew, and we made new friends here," said Kirchner, adding that she planned her wedding and the renovation of her home at one of the tables. 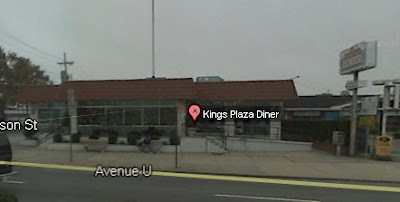 Opened in 1975, Kings Plaza, with a fully stocked cocktail bar, is one of the only New York diners to win back-to-back Daily News' Diner of the Year Awards. It won in 1995 and 1996. Nick Stathos, 58, one of the original owners, leased the land earlier this year to a national developer. Stathos and his new partners plan to open another diner in the neighborhood soon. Is NPR The Right's New ACORN? Money Well Spent On Sarah Palin? I Think Not. Millions Attend Progressive Rally In Washington!